…Starting to melt in the heat of the South. Here in Georgia, the thermostat seems to steadily rise, when it’s not taking sudden leaps, always boasting of the advent of summer. In this heat of this state, it would appear as if spring only lasted a week or so, the summer sun prematurely rising into the spot light. A burden of lethargy, yet an air of nostalgia- the Georgia heat reminds me to be grateful for the New York breeze. Each day, my attention is turned to the approach of June, my ear tickled by the call of the Chelsea tune, and the hairs on my arms erected by the chilling air of creativity that wafts through the city streets of Chelsea. The Chelsea Music Festival is more than music. The melody of the music studio- better known as the kitchen- has been proclaimed throughout the Chelsea Market in downtown Manhattan and has caught the attention of Ken Masur, the artistic director of the Chelsea Music Festival. The Chelsea Music Festival is comprised of a series of events in celebration of the creative spirit that pervades the Chelsea district of lower Manhattan, showcasing the imaginative works of numerous artists from within all aspects of the fine arts spectrum. Last year, the festival celebrated more specifically the birth of Claude Debussy, a French composer, lending to the rest of the festival a theme which explored mutual inspirations among the French and Japanese art forms- musical, visual and culinary. Last year’s festival was the first ever to feature the culinary arts in such detail with great depth and attention. 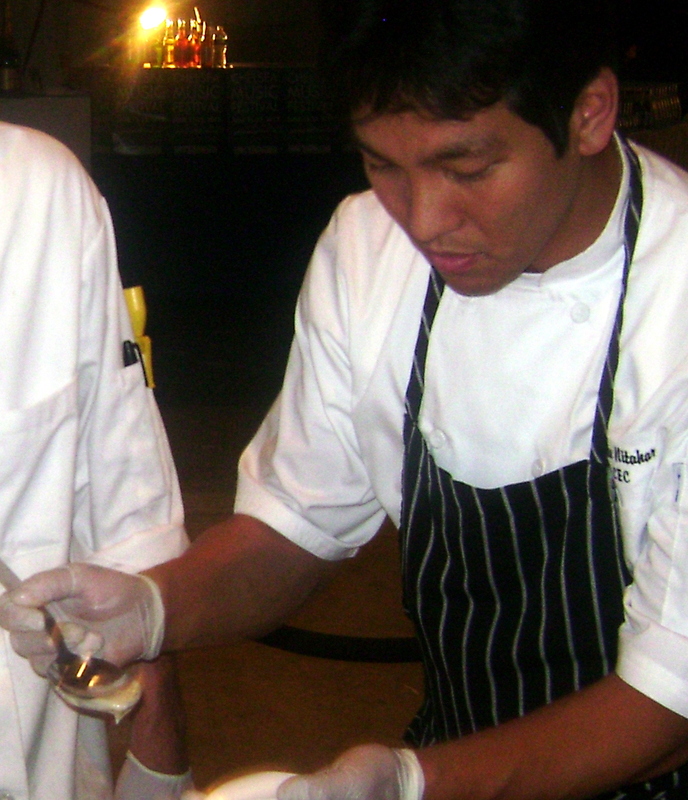 In addition to musicians and composers and visual artists, Chef Lance Nitahara stood on the forefront of the happenings. Lance Nitahara is a chef of many accolades, having graduated with honors from the Culinary Institute of America with a bachelor’s degree. He is an ACF Certified Executive Chef and a Certified Pastry Culinarian. He has won several competitions and medals. He was a champ on the Food Network’s “Chopped” and appeared on “Iron Chef America” as sous chef to Madison Cowan. He now teaches as a Chef Instructor at Flint Hills Technical College in Kansas. With the assistance of students recruited from his alma mater, including myself, Chef Lance plated dishes that, in collaboration with the event’s theme, displayed the marriage between French and Japanese cuisines. His dishes weren’t the latest idea of “fusion”- preparing Japanese cuisine via French technique; but he tactfully wedded elements of each cuisine that complemented the other, with little assistance from the powers vested in molecular gastronomy, utilizing such techniques as sous vide and gelatin consommes. The menu was built from such dishes as Ahi Tataki nicoise: a composed salad of lightly seared tuna squares lying beside konbu croquets, bias cut haricot verts, and a tomato jam, dotted with miniature black olives, to be draped in the bursting creaminess of a poached quail egg; kabayaki pork belly, slow cooked as confit, seared and glazed in the soy-based kabayaki sauce, and tied to a streak of salsify puree by a nest of chocroute onion ribbons; and sakura and umeshu panacotta, flush with the blushing flavors of cherry blossom, lightened by a pillowy dollop of Goma (black sesame seed) crème fraiche, piqued by the addition of a Shichimi phyllo crisp. The selections beautifully mirrored each night’s specific theme. The beauty of catering the Chelsea Music Festival was nestled in the “kitchens” proximity to the musical performances. When working in professional kitchens , I often crave the rhythmic momentum provided by music; it’s not very common to be accommodated in such a way. At the festival, as we prepared foods for the receptions, the sound of our knives drumming against the cutting board, the applause of the searing fish, and the humming of the oven were harmonized by the more conventional tune of the strumming of a violin, the impression of the piano keys, the breath of the flute, and the plucking of the koto strings. There was peace in the waves of music and the aromas of the French and Japanese kitchens that pervaded the lungs. It was a delightful opportunity to work with Chef Lance Nitahara and in such an atmosphere. He is a forgiving and amiable individual, inspiring learning every step of the way. He urged his assistants to taste everything, not just the dishes or components they were working on, but all that could possibly be tasted. He offered exposure to the Japanese culture and joyfully accepted any questions. It was also fun to hear him remember his times at the CIA. Not bound to the musical instrument cases, the Chelsea Music Festival, I learned showcases plenty. It is a realization of the arts at large and is on the rise. There are great things in store on CMF’s horizon. I hope to take part in this year’s events. The Festival, moreover, shines light on the growing interest in our craft. 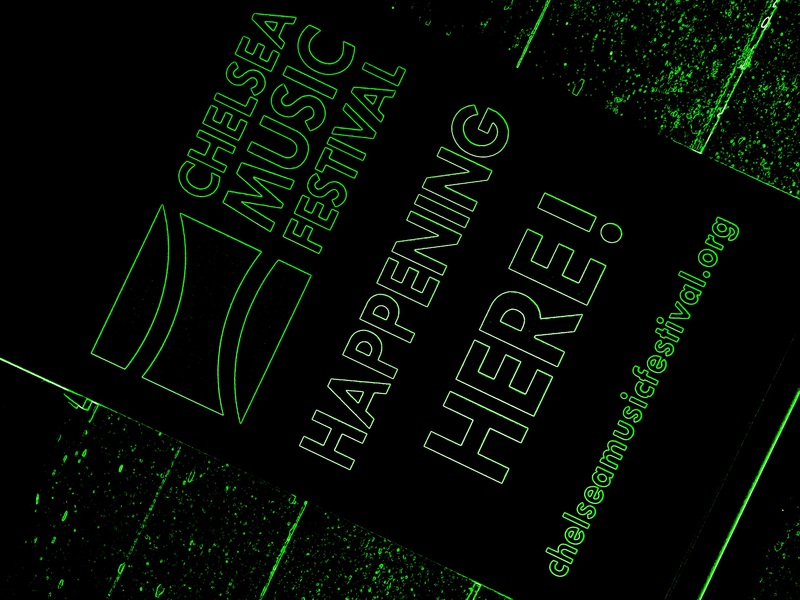 As it aims to exalt cuisine, the Chelsea Music Festival, itself, will be exalted. From food and wine to musical staff-and-bar lines, cheers to the Chelsea Music Festival. Next Post Ever Heard of Garbage Bag Salad?